Honda's "almost 350" offers 36bhp to cruise comfortably two-up, but stays light enough to tickle through the traffic to work. In short, it's the right size at the right price. 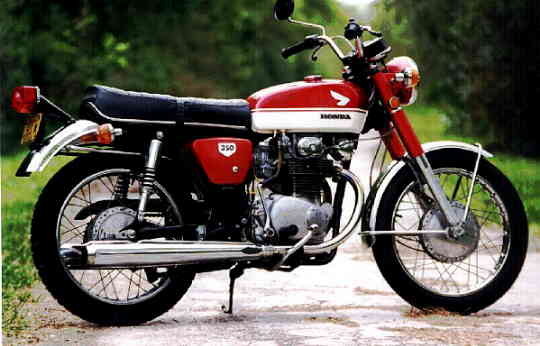 Whatever the price, it will be about half as expensive again as the 350 twin. The four will boast smoother power and probably a disc brake but that won't stop the current 350 being the best value for money around. The CB350 is a proven best seller and offers acceptable all-round performance and tremendous length of service at a price that will ensure it holding it's position of popularity for many years to come. Our test model was loaned to us by John Burrows of Malvern Motorcycles Melbourne, who handed over the bike straight from the crate. This gave us the chance to break it in for several hundred miles and experience the bike from new until it had completed an arduous test. During the initial miles the motor quickly freed up and soon wanted to rev right round the tacometer. The only fault which developed was the down-shifting through the box. It began to be sticky, but as John predicted, it cleared a few hundred miles later and the movement performed faultlessly from then on. With precise choke control, starting never goes past the first hit of the button. The three positions on the butterfly valve choke control are: Fully closed - cold starting, Marginally open - warm-up, and Fully open for normal running. Apart from first thing in the morning the choke remains fully open. A neat functional handle is provided on the left hand side just behind the rear unit to aid the lifting of the machine on and off the centre stand. Both stands are provided with rubber blocks mounted on the frame to take the impact when they are released. Honda have really had a field day with rubber on the CB350. Rubber blocks mount the rear light, read light bracket, carburettors, ignition switch, instruments, reflectors, handlebars and the rear brake anchor arm. This means extended component life and rider comfort. The other synthetic material - plastic - is used for the chainguard, side panels, headlight and air filter boxes. Mounting the machine, the rider is confronted with a notice on the tank; "Remember - preserve nature, always wear a helmet, think safety". A wise way to occupy a dozen square inches on a large tank surface area, but the effectiveness if its message does mellow with age. The positioning of the controls is, as always with Honda, excellent, except (here it comes again) the ignition which demands that unnatural forward lean and the groping action with the left hand till the key finds the hole. A smooth tickover needs only to be slightly blipped to pull away, with the power coming in at around 3000rpm and staying till nearly 11000rpm. Top gear can be used down to 30mph. The five gears are correctly spaced and well chosen for weight and power. The road holding is a match for most in the class but the stands ground a little too early and limit left-handers far more than the right footrest on right-handers. The three positions on the rear units seem sufficient for normal riding, two-up touring and fast bend swinging over bumpy surfaces. Though no steering damper is fitted we couldn't find the need for one. Both brakes work excellently and either tyre can be made to utter screeching sounds. Fade occurs only under abuse and can be practically forgotton for normal use. In contrast to some 350's both mudguards offer good protection, a result of their circumference and relatively deep valancing and plastic mudflap fitted on the rear mudguard. Though the engine is about 10% smaller than other 350's (325cc) the output is a competitive 36bhp; enough effective performance to accelerate easily out of trouble when overtaking slower traffic. Mabye if Honda actually made a 350cc motor instead of uprating a smaller unit they could arrive at 40bhp with the same stage of tune. During the 1500 mile test the well sorted SOHC layout proved utterly reliable. it was a welcome chance to test the machine in the face of conflicting reports. Many owners boast nearly 40000 miles from earlier but similar models. Some people beleive that the camshaft running in the plain-bored aluminium of the cylinder head will wear quickly, giving rise to an expensive repair. We could find no evidence of this. Four huge botton-end bearings hold the stiff crankshaft assembly with its roller big-ends and the centrally positioned camshaft chain. The transmission, after the initial stickiness, freed up and operated faultlessly, but the shifting linkage developed slop. This is likely to become excessive with wear around pins and rod holes, and make the movement unnecessarily long. As a whole, the power plant was trouble free and straight forward to maintain. We lived with the CB350 for many weeks and over 1500 miles and came to the conclusion that it had rightly earned its position at the top of the popularity stakes. It ofers the most for your dollar in a package that is the best all round size for many duties the average owner could ask of a motorcycle.